Sweet corn has been grown for at least 7,000 years and was already a very popular food among the Native American tribes. Around 1780 it was given to European settlers and it did not take long before it became a popular vegetable in southern and central regions of the United States. Nowadays, its popularity has spread worldwide and it is used in many dishes or as a vegetable by itself. We don't have to wait till harvest time; it is available in the stores all year around. Aside from being a pleasure to the taste buds, sweet corn has many health benefits as well. 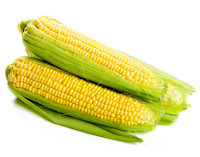 One medium ear (90g) of corn provides a good source of vitamin C, thiamin and folate for about 80 calories. The phytochemical zeaxanthin supplies corn's yellow color and helps maintain eye health. According to USDA researchers, zeaxanthin intake may also reduce the risk of certain types of cancer, especially lung and breast cancers. Enjoy cooked corn! Cornell University researchers found that heat increased corn's total antioxidant power by 44%. Cooking liberates the antioxidants from the corn plant cell walls, while deactivating enzymes that would otherwise inhibit antioxidant activity. I found it has much more nutritional value then the ones already mentioned above; corn is also a good source for pantothenic acid (vitamin B5), dietary fiber, phosphorus and manganese. The folate in corn reduces the risk of heart attacks and colon cancer, while the cartenoid in it lowers the risk of lung cancer. Corn is also excellent as prevention for age-related impairment in mental function and Alzheimer's disease. Corn can be boiled, steamed, roasted and grounded. When buying corn on the cob, be sure it comes out of the refrigerated section or, when buying from a stand, kept in a shady place. This will prevent the sugar turning in to starch which diminishes the taste quite a bit. Ensure the husks are fresh and green and to be totally sure you have fresh corn, push one of the kernels with your nails. When a white, milky substance appears you know it is as fresh as can be. It is best to eat it the day you buy it, but if that is not possible then store it in a plastic bag in the fridge, without removing the husk. For freezing; boil the corn on the cob for about 7 to 11 minutes (depending on the size) and put it in heavy duty freezer bags. You can keep them for up to a year. If you freeze just the kernels, then keep in mind to use them within 2 to 3 months. Sweet corn should either be eaten fresh, canned, or frozen before the kernels become tough and starchy. It does not store long; a couple of days at the most. I know; that is nothing compared to all those years we are granted on this earth. However, the years of our lives on earth are nothing compared to eternal life. As for man, his days are like grass; As a flower of the field, so he flourishes.